Happy 2018, everyone! 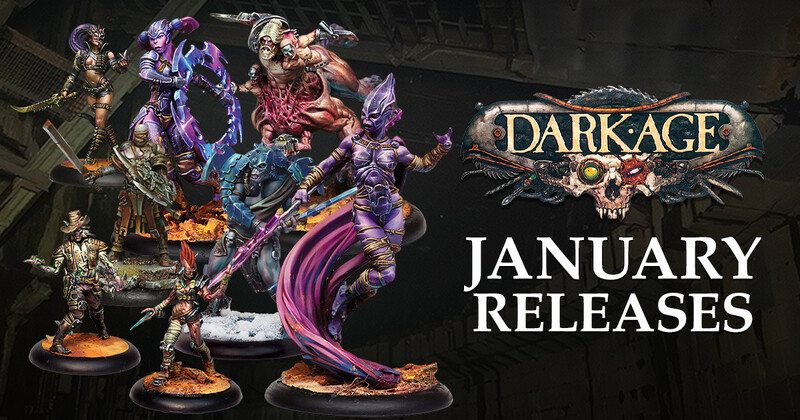 We’re starting off the New Year with a whole plethora of new Dark Age releases. We’ve got something for everyone. In terms of new minis, there’s Dragyri and Skarrd, but even if you don’t play those factions, you still get the new Secondary Objective Deck. This contains new cards for every faction. So, head on down to your LGS or the CMON webshop and pick up yours today. A great new addition to the Dark Age gaming resources, the Secondary Objective Deck Add-On is focused on allowing players to tailor their decks to best fit the faction, not just the force, that they are playing at the moment. By adding additional objectives based on the narrative and abilities of the various factions, a player’s game can be made that much more flavorful and fitting to their playstyle! Following up that, the Dragyri are getting a lot of new boxes. We start you off with the Soul Warden box. The Soul Wardens are the mystic spiritualists of all the elemental castes. Bringing a control and command of the elemental energies and the creatures they can summon, Soul Wardens are important psychogenic foci masters on any battlefield. Heading to the different sub-factions within the Dragyri, we next go to the Air Caste Death’s Device box. Death’s Devices of the Air Caste are known for their ferocity and fortitude. They never shrink from battle, often leading the charge against their enemies. They never stand still on the battlefield, always seeking new targets or new angles of attack against their current target. Not to be outdone, the Ice Caste is getting their own Death’s Device box. When they reach a certain age, aspiring members of the Ice Caste military structure train with Soul Wardens on developing their Ice Focus. While many receive the calling, there are a handful who do not. These warriors may choose to leave the military in dishonor, or they may redouble their physical training efforts and join the ranks of the Death’s Devices – the Ice Caste’s brutally efficient executioners. They say that deaths often come in threes. That’s certainly the case with Death’s Devices boxes. The Shadow Caste is getting one as well. There are many types of devoted soldiers in the Shadow Caste, but few are more terrifying than the Death’s Devices and the Raaf. Rubbing their armor with raw fear-inducing pheromones, the Death’s Device can kill with terror as easily as they can with sword and shield. The Raaf are lethal knife fighters that love nothing more than the feel of xenosathic alloy slicing through flesh. But that’s only the first of the Shadow Caste releases this month. Up next is the Umbra Shadow Elemental. Brought to this world a long time ago from another corner of reality, the Umbra are half ethereal, shapeshifting monsters that have agreed to serve the Shadow Caste as their horrifying elementals. Forming claws and blades to slice physically while tearing apart a foe with fear itself, the Umbra are battlefield nightmares made real. Finishing off the Dragyri releases, there’s the Spiderlings box for the Shadow Caste. The hordes of Arachnae that live beneath the crust of Samaria have served the Shadow Caste for millennia. They come in many shapes and sizes, but they all are poisonous creatures that scurry and leap into the enemy. They swarm over their foes, letting the toxins do their work, and feast upon what remains once the battle is done! But the Dragyri don’t have all the fun. The Skarrd faction is making its presence known, especially the Cult of Decay. They have a new Starter Box available. Created in the aftermath of an atomic detonation, the Cult of Decay takes the power of mass destruction and mixes it with Mother Blazon’s psychogenic necromancy to create a teeming mass of undying things. Taking the Skarrd ideals of evolution to a point beyond the grave, those who serve the Decay Cult are awash in radiation, mutation, and a relentless mission to send all life to the Beyond. Starter Boxes are, of course, just a start. Want to expand your Skarrd army some more? Check out the Leadership Box. The Skarrd Horde is far reaching and has given birth to several individuals that have proven themselves to rise above the rest. The laboratory-made assassin Saber has her deadly, flashing swords. The original, pre-transformation version of Blazon shows loyal troops new ways to kill. Jon Woe, Warwind-turned-Grafter-turned- Heretic Leader, leads from the front with his faithful robotic murder-medic, ANG-1E. With the Starter Box and the Leadership Box, you’re well on your way to a Skarrd force. Time to bulk it up some with the Flesh Echoes Unit Box. Flesh Echoes. A combination of an irradiated, psychogenically-reactive mold, fresh corpses, and dangerous rituals, Mother Blazon and the Reapers of the Decay Cult create these horrors. These monstrosities are puppet-like beings that exist on this side of death only to serve their Mother. Typically made from corpses dragged from overrun Outcast and Forsaken settlements, a front-line of Flesh Echoes has often been able to unnerve even the staunchest defenders on the walls of the next town under attack. We’re starting 2018 off with a bang! You can get all of these great box sets now.